The longstanding close personal relationship between Richard Mille and motor sports legend Jean Todt has lead not just to the latter wearing the former’s watches, but also watches designed in his honour. Earlier this year we had the opportunity to see one of the three special editions created by Mille for Todt to commemorate fifty years in the world of racing, from rally driver to motor sport management to President of the Fédération Internationale de l’Automobile (FIA). The ‘Jean Todt Tribute’ collection consists of three pieces : the RM11-03 Richard Mille Blue Quartz TPT, RM 050 Richard Mille Blue Quartz TPT, and the RM 056 Richard Mille Blue Quartz TPT, in limited editions of 150, 50 and three pieces respectively. 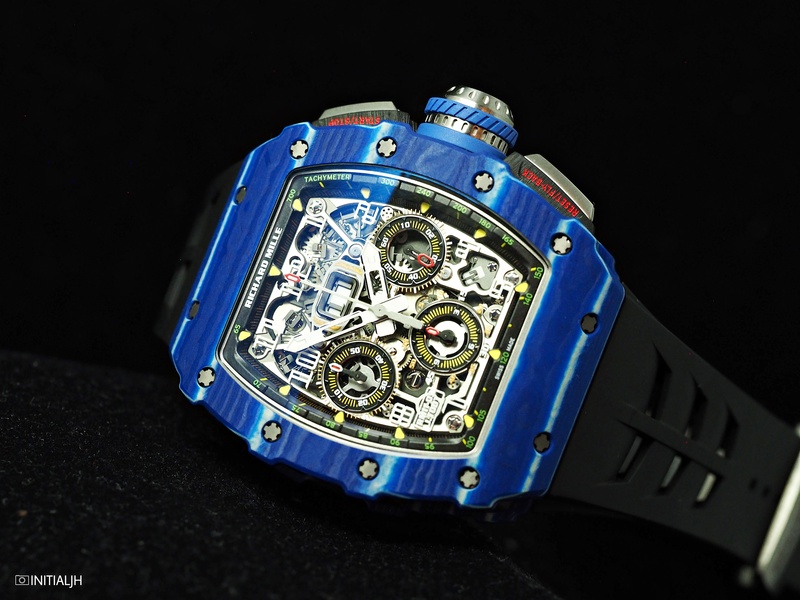 Today is about the RM 11-03 Jean Todt 50th Anniversary, which is is based on Richard Mille’s RM 11-03 flyback chronograph but with a very distinctive exterior – a blue and white variant of the Quartz TPT™ (‘Thin Ply Technology’, from creators Thin Ply Technology) material which Richard Mille introduced in 2016 in a red via the RM 27-02 Tourbillon Rafael Nadal. This composite is created by stacking together 600 layers of silica each 45 microns thick, which is then impregnated with a blue resin before being heated to 120 °C then machined. What you get at the end is an extremely light and tough case, two features that are central to Richard Mille’s product ethos. Powered by the automatic Calibre RMAC3, the baseplate and bridges are made of an alloy that is 90% Grade 5 Titanium, 6% Aluminium and 4% Vanadium. The movement also has PVD treatment, sandblasting, rhodium-plating, and hand chamfering and polishing, finishing-wise. This is a very shiny and glossy watch, and with its lightness (a scant 9.5 grams for its 49.94mm x 44.50mm x 16.15mm dimensions), material innovation and open skeletonised dial, couldn’t be anything other than a Richard Mille. Why blue? Apparently it’s Todt’s favorite colour.